Routing Rules can be set up to automatically route a file to a user or user group as soon as that file is assigned to a particular Workflow Status. Example: When a file is set to the status 'For review', it can be automatically routed to a user who needs to review the content of the file. Routing Rules are defined on Brand level and are managed on the Brand Maintenance page. For periodic Brands (such as magazines and newspapers), Routing Rules are created on the Brand Maintenance page. For project-oriented Brands (typically used by book publishers and advertising agencies), Routing Rules are created on the Issue Maintenance page. For periodic Brands: access the Brand Maintenance page for the Brand in which you want to add User Routing. 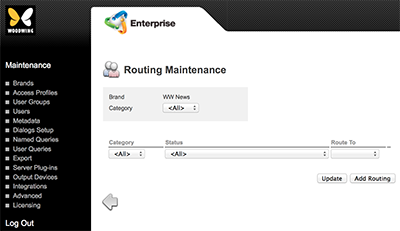 For project-oriented Brands: access the Issue Maintenance page for the Issue in which you want to add User Routing. Step 2. Locate the Routing options. The Routing Maintenance page appears. Note: The Category list at the top is for filtering the page to show only those Routing Rules for the chosen Category. Since no rules have been set up yet, this option currently has no effect. Step 4. Set up a rule by making the relevant choices from the Category, Status and Route To lists. Click the Add Routing button. This will save the currently added rule and automatically display a new row of lists for adding a new rule. Click the Update button. This will save the currently added rule without displaying a new row of lists.